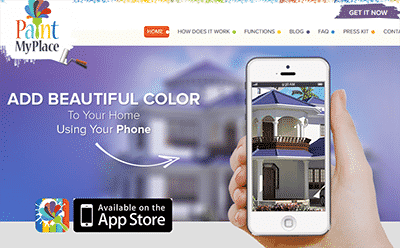 Here we share the best paint color app for finding the perfect shade and color matching. Choosing paint colors can be a hassle for some, but now there are different tools to make the process a bit smoother. Some of the most helpful ones can be easily downloaded right to your phone! Others are available online with great features to match colors or visualize new ones! With the help of these apps the decision of which to use will be hard than choosing the color itself! While it may seem as easy as jumping into the app store and clicking download, unfortunately there will still be decisions to be made. With one app comes many, and each brand or store has their own paint color app that they will want you to download. Here is a quick breakdown of which ones are worth a download! 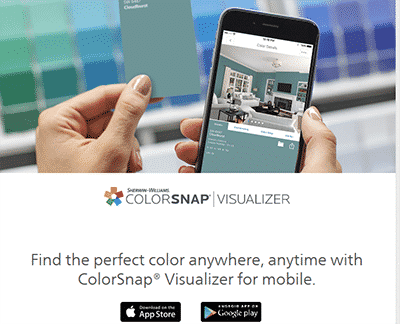 Sherwin Williams has come out with a color matching app that is available for mobile devices such as iphones and androids as well as online. This app is able to take a color from photos to help match a color to pieces that you may already have or things that inspire the space to find a true accent color. You can try out one of the many paint colors on a room photo you upload or one from their gallery to get the shade you want.This works great for when you want to see exactly how a color will look in a room in your own home. The program also includes a feature that will let you project the color chosen onto the wall in the phone, showing what it would look like when painted the selected color. Once a color is selected the app will also provide information on the color as well as coordinating colors and easy ways to share this information with others! This is a free app to download and will 125.4 MB of space as well as IOS 9.0 or newer. Get the Sherwin Willams paint color visualizer here. Valspar is a paint brand that has come up with a really useful tool to help find the perfect paint color. This is an online application that will allow you to begin by uploading an image that you are hoping to pull a color out of or match. The program will analyze your photo and find the top five most prominent colors in the photo. From there you can see the color details or order samples. If it did not pick up the color you were looking for, you will be able to click on the color in the picture and the program will bring up that colors information as well.In addition you can scan their library of interior designs to find a color that you like for more ideas. Finally the program will help you locate a retailer to get all the paint you need. This application is easily used and is accessible anywhere with an internet connection. Get the Valspar photo match app here. 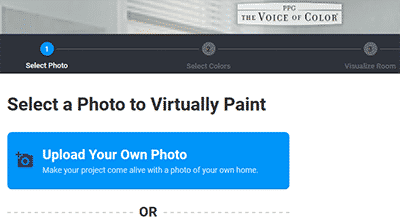 The voice of color is an online color matching application that will allow you to select or upload a photo to virtually paint. After selecting the photo you will select or upload a color, which will be placed in the areas you select. This will give a three dimensional visualization of what the room will look like as each color selected. 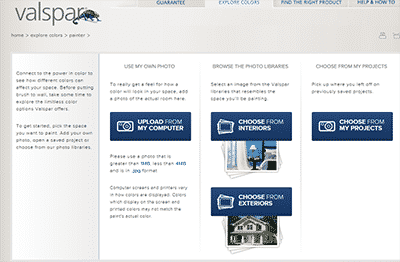 This program also includes a feature to offer paint samples or even where to buy the paint colors you have selected. You can search their database of colors by name as well as look at a variety of color palettes to find the hue you need. This is an easy application to use and will be available on any device that can connect to the internet. Use the Visualize Color app here. The home depot paint color app will be downloadable on iphones and ipads. 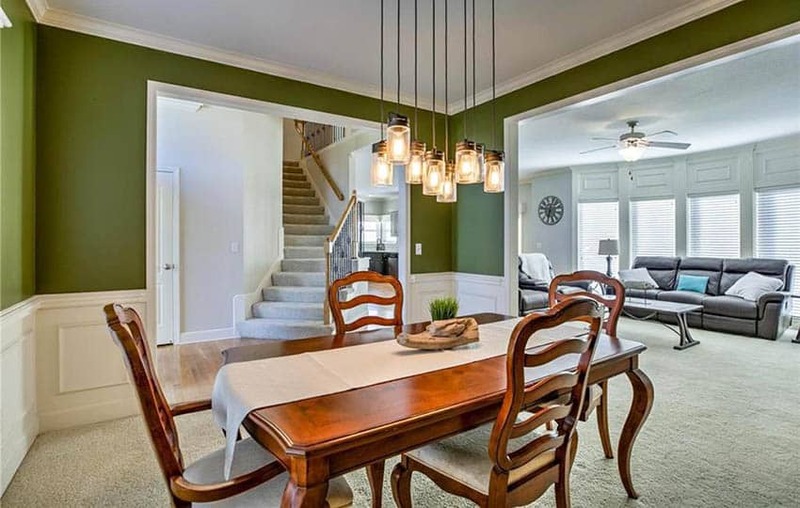 This program will allow you to browse the paint colors available, explore the trends in the current market, match any existing colors in the space, and once a color is chose it will even allow you to preview and purchase the decided upon paint color. In addition to these great features having this app will allow you to save the colors used or your favorite, so the next time a project comes up you will not need to start from scratch. This is a free app to download and will 148.8 MB of space as well as IOS 10.0 or newer. 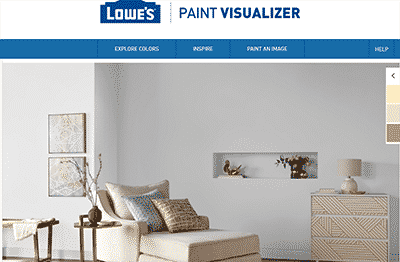 Lowes is another retailer that has a paint visualizer application on their website. This will allow users to see the colors before even lifting a brush! First you will be able to upload your own room or pick a preloaded image to test the colors out virtually. Following that selection you will be able to select some colors to try, these will be lined up on the bottom for easy access. There you will “paint” the room virtually to see how the colors will look next to each other or with other colors and materials. When completed you can download the image that contains the room as well as all the paint colors in your palette specifying which you had selected. This makes for easy selection when visiting Lowes or even ordering the paint colors online! Get the Lowe’s paint color visualizer here. The Paint My Place color app will be downloadable on iphones and ipads. This program will allow you to virtually paint the room and will include the furniture! Paint my place color app will let you use a wide variety of brands and all their collections and colors. With many different designs and selections this program allows you to use it will allow you to save your creations for later viewing and to remember colors used in previous projects. This is a free app to download and will 12.8 MB of space as well as IOS 5.0 or newer. Though it is free, there is a paid upgraded version of this app for $2.99. Get the Paint My Place color app here. Behr has come out with a paint color app that will be available for both iphones, androids, and includes a web version which these were based off of. This program allows the user to see all the collections and colors Behr has to offer, photo matching tools, and room previewing. In addition to those features it will also allow the user to save the colors as well as room calculations and any images used to create the project. This will help select a color and then sent you to the store nearest you. This is a free app to download and will 153.5 MB of space as well as IOS 9.0 or newer. Get the Behr color app here. To see more great ideas visit our best kitchen paint colors here, best bedroom paint colors here, or living room paint colors here.